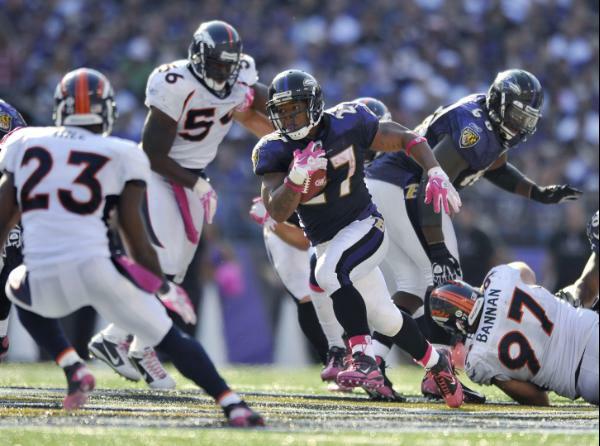 Advanced Football Analytics (formerly Advanced NFL Stats): What Is the Break-Even Run Success Rate? 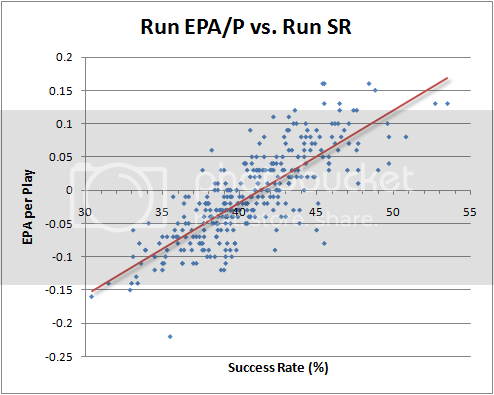 I've been looking at run Success Rate (SR) lately, and it appears to be a fairly important indicator of team success. But if I said that a particular team's run SR was 45%, how would you know if that's any good? It's less than 50%, so does that mean it's bad? So I decided to plot Expected Points Added (EPA) against SR to find out where the break-even point is. 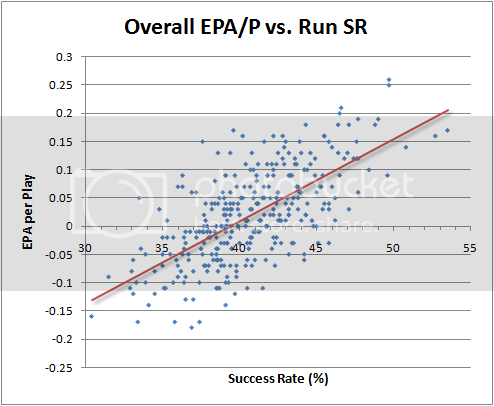 When I plot run EPA per play vs. run SR (for 2000 through 2009), the break-even point is where the best-fit line crosses EPA/P axis--just above 41%. But remember that run SR correlates with passing success too. When we consider both play types, it appears that a team needs just over a 39% run SR to have a net positive EPA per play. When I did the same thing with WPA vs. run SR, I got the same break-even values. Who are the leaders so far in offensive run SR in 2010? NE is way out in front with 52.3%. OAK, HST, DAL, PHI, and JAX make up the second tier, ranging from 49 to 47% (through Sunday afternoon). What about defenses? Atlanta tops the list with a 69.9% defensive run SR (offenses are successful only 31.1% of the time). SEA, BLT, and NYG are right behind. To see the full lists, just visit the advanced team stat page and sort by run SR column. SR for running backs (and other positions) is available on the individual stat pages. Although I hate to drag this from the quantitative to the qualitative, I really like this SR metric because I think it explains a lot about how coaches AND players think. I've been on the field playing defense when we're getting our butts kicked and I can tell you how demoralizing it is when the opposing offense manages to keep cranking out successful plays. It doesn't necessarily matter if those plays don't qualify as "big" plays. You can definitely feel when you're getting marched upon. I think you posted the same graph twice. This is off topic, but an interesting thought experiment nonetheless. It involves timeouts so the WP calculator, while helpful, cannot fully answer the question. Last night the 49ers were down 3 points with just over 2 minutes left to play (say around 2:08) and about to kickoff with all 3 timeouts. The Eagles were prepared for an onside kick but had a man deep to return a normal kick. 1. Kick deep, try to force the Eagles to punt, use timeouts to stop the clock, and set up a last minute drive? 2. Try an anticipated onsides kick and recover the ball? 3. Or as one of my friends suggested, kick the ball out of bounds and sacrifice field position but save the two-minute warning? With only seconds remaining above 2 minutes, any type of return meant the two minute warning would occur before the Eagles' first play. It should be noted the 49ers chose option 1 and got the ball back on their own 32 with 1:28 left to play and one timeout.